Abstract. Upper-air balloon soundings for weather predictions have been made since the beginning of the 20th century. New radiosonde instruments for in situ humidity-, radiation- and gas-profile measurements in the troposphere and the lower stratosphere, were introduced in recent years for atmospheric research and climate monitoring, but such instruments are often expensive and it is desired they be reused on multiple flights. Recovering instruments that freely descend with parachutes is time consuming, sometimes difficult and even dangerous. Here, we introduce the return glider radiosonde (RGR), which enables flying and retrieving valuable in situ upper-air instruments. The RGR is lifted with weather balloons similar to traditional radiosondes to a preset altitude, at which time a release mechanism cuts the tether string, and a built-in autopilot flies the glider autonomously back to the launch site or a desired preprogrammed location. Once the RGR reaches the landing coordinates it circles down and releases a parachute 100m above ground for landing. The motivation for this project was to measure radiation profiles throughout the atmosphere with the same instrument multiple times and with a rapid turn-around time. 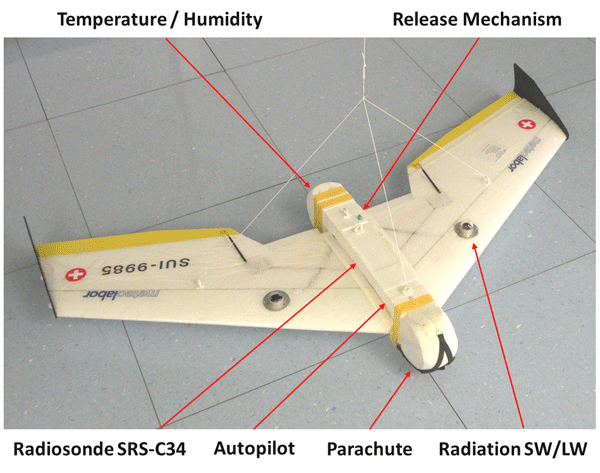 The paper describes technical aspects of the return glider radiosonde and the built-in radiation instruments and shows test flights up to 24km altitude that are analyzed in terms of flight performance and maximal distances covered. 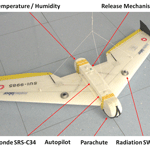 Several successive flights measuring radiation profiles demonstrate the reliability and the operational readiness of the RGR, allowing new ways for atmospheric in situ research and monitoring with payloads up to several kg depending on the specific size of the glider. How to cite: Kräuchi, A. and Philipona, R.: Return glider radiosonde for in situ upper-air research measurements, Atmos. Meas. Tech., 9, 2535-2544, https://doi.org/10.5194/amt-9-2535-2016, 2016. New radiosonde instruments for humidity-, radiation- and gas-profile measurements were introduced in recent years for atmospheric research and climate monitoring. Such instruments are intended to be reused on multiple flights. Here we introduce the return glider radiosonde (RGR), which enables flying and retrieving valuable in situ upper-air instruments. The RGR is lifted with weather balloons to a preset altitude, and a built-in autopilot flies the glider autonomously back to the launch site.